BandBites, Volume I, No. 10, September 15, 2007. Copyright © 2007 by Carol Caffin. All Rights Reserved. 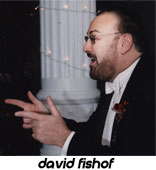 Over the past 25 years, David Fishof has been hailed as one of the most creative and innovative entertainment producers in the world. David has brought to the world some of the most original, successful and exciting live shows in music. 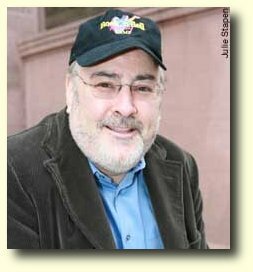 He is the founder and creator of the famed Rock 'n Roll Fantasy Camp. Read more about Fishof at his Davis Fishof Presents web site. A few years ago, I wrote a personal postscript to Rick’s press bio in which I talked about the day Rick invited me to a show and asked me if I wanted to work with him in a “formal capacity.” Formal capacity? If you knew Rick—you are laughing right now, as I’m sure he was laughing (inside, at least) when I arrived at the show with my blazer and my notebook, ready to take notes and answer job-interview questions. The word “formal” is not in The Band’s lexicon. And as for job descriptions and titles, just as The Band themselves played what they played and sang what they sang the best and most natural way they knew how without worrying about what to call it, people who have worked with The Band over the years—with the exception, perhaps, of those whose duties were cut-and-dried, like booking agents—did what they did best, regardless of their title. If you work with The Band, you do what needs to be done. Period. Hours: 2 pm until whenever, from now until I get tired of you or until I crash your car. Driver’s license and back-up vehicle required, just in case. In all seriousness, from my experience and recollections, at least, the guys in The Band did value smarts—knowledge, connections, moxy; all of it was important. But what they valued most was loyalty. And it’s no wonder. Being the friendly, accessible guys they were, they were often easy targets for shysters and swindlers who presented themselves as “friends.” So they needed people they could count on, not just when they were riding high, but when the chips were down, too. The Band saw more than their fair share of sharks and snakes and yes-men. But there were—and are—some really good people, too, people who not only knew the ins and outs of the business, but who had the guys’ best interests—not just their own—at heart. From everything I know, David Fishof, who managed The Band—more or less—for a while in the 90s, was one of those people. I talked with the soft-spoken but savvy promoter, producer, and deal maker, who’s best known these days for his successful Rock ‘n Roll Fantasy Camp, soon after Levon’s sold-out New York performances at the Beacon Theater in March. Here’s what he had to say about The Band. CC:	Tell me a little about your early background. You were a sports agent at one point, but how did you get started in entertainment? DF:	I started in the Catskills, booking entertainers. Then I went on to become a sports agent, and I represented great athletes like Lou Piniella, Phil Simms, Randy Myers, Jim Burt, a lot of the New York Giants. So that was my business. CC:	When you say you started in the Catskills, do you mean just the entertainers you booked? Did you live there, too? DF:	Well, the Catskills was a great area…there were a lot of hotels there, and it was a home base for people like Milton Berle and David Brenner and all these great comedians and singers. Sammy Davis—they all started working at these Catskill Mountain hotels. So, as an agent, that’s where I started. CC:	Were you born in New York? DF:	I was born in New York City. My dad was a Holocaust survivor. I lived in Hackensack most of my years, I moved to the city, and have been working out of Manhattan for many years. I [remember] going back and forth to Woodstock on many occasions. CC:	Was that because of The Band or before The Band? DF:	Because of The Band. CC:	Well, before The Band, you were working in the Catskills. You started there in the 70s? DF:	I started in ’74—’75. Then I went on to represent professional athletes after that, Elliott Maddox being my first client. Then, from there, I started representing the Association and I started packaging tours—the Grass Roots, the Turtles, the Association, the Mamas and the Papas. Then in 1986, I brought the Monkees back to this country and, together with MTV, it became a stadium tour, with arenas—it was probably the biggest comeback tour of any band. CC:	I remember that, but I didn’t realize that you had packaged tours. What did you do after that? CC:	Wow. So the musicians were Ringo’s choice? DF:	Yeah. That was Ringo’s idea. CC:	Just to backtrack for a second, what gave you the idea, what prompted the idea, for Ringo Starr? DF:	My brother was a drummer and a big fan of his, so I grew up hearing his name all day in my house, and, you know, I was a fan too. I was a Beatles fan and, being in the music business, I thought if I could work with the greatest drummer in the world and the greatest band in the world, how amazing that would be. So I went after him. CC:	The greatest drummer being Levon, right? [laughs] Come on, now David, what’s true is true—he is the best. DF:	Levon happens to be one of my favorites. Let me tell you something, I went to see him the other night, and there is no cooler drummer than Levon Helm. CC:	Well, that’s for sure. DF:	To see the way he can sing and he can play the drums. It’s just un-believe-able. Yeah, Levon’s amazing. CC:	He certainly is. Back to Ringo. You approached him, and he gave you this list of musicians including Rick and Levon. Is that how you first got involved with The Band? DF:	Yes. I got involved with them that way. I met them through Ringo and we toured together on the road, I got friendly with Levon and Rick and, I guess it was the second to last night before the tour, and I was sitting at the Aladdin Hotel in Las Vegas with Joe Walsh and Levon Helm. And I’ll never forget—we were just sitting and chatting all night, having a few beers with the two of them. It was an amazing night; I’ll always remember that night. And the three of us said ‘We should build a casino here with a rock and roll theme.’ And ten years later, a place called the Hard Rock Hotel and Casino opened. Last year it sold for a billion dollars. I always think of that conversation. It was a great bonding experience. Following the Ringo tour, I was honored to pick up Levon and Rick as clients for The Band, and pick up Joe as a client. They asked me to represent them, and that was the start of my rock and roll fantasy. It was a life-changing experience meeting these amazing people. CC:	So Levon asked you to represent him, or you represented The Band as a group? CC:	Is that how the Columbia deal came about? DF:	That’s how the Columbia deal started, yeah. CC:	Was that ’89 or ’90? DF:	That was 1990. And it took a while to get together, but we got together, and we were in the studio for a while. And then, we went in the studio and the producer was really…he had just come off of doing different artists. I know he had done Cyndi Lauper. And the guys worked really hard in the studio. CC:	So that was Rick, right? Rick Chertoff. CC:	That’s interesting, and I know what you mean. Around that time I had a friend who was a studio engineer teach me the basics of the soundboard and how to mike instruments, because the first time Rick asked me to get him a D-box, I had no idea what it was and just said ‘Sure!’ Then I asked the soundman to tell me what it was and not to mention it to Rick. So that little background came in handy when advancing Rick’s shows in different venues and with different setups. It’s all fascinating. DF:	Yes, it is. I give Levon a lot of credit for making me want to learn more about this business. CC:	Your name was associated with The Band in the early 90s, especially. At that time were you their business manager, personal manager? DF:	I wasn’t their business manager. I managed them. CC:	So you were their personal manager? DF:	They had a lot of friends, but they had a lot of people who took advantage of them also. DF:	And I saw a lot of that. But they did have a lot of friends. I think what was most amazing about them, and working with them, was to see the respect that every musician had for them in the industry. It was interesting to represent them. CC:	I know. I still hear stories and think what is it about them? I mean, it goes without saying that they’re musically amazing, and their personal charisma and everything, but there is something else. I mean Eric Clapton quit Cream after he heard them supposedly, and I remember George Harrison talking about being disenchanted with The Beatles after he hung out with them in Woodstock. DF:	Well, you know, that’s because they got the best drugs from up in Woodstock. CC:	Where did Joe Forno fit into all of this? He was referred to as The Band’s manager around that time, and I had some interaction with him through about the mid-90s. Did he work with you or for you? DF:	No, Joe never worked for me. Joe was really Levon’s guy. He did The Band…he was a business manager for them, he did some work for them. I did all my dealings basically with The Band and Joe was, to me, like a tour manager, on the road. Once the deal was done and everything, he would make sure they would get there and he did all the road stuff. CC:	The logistics and stuff, right? CC:	There was also a guy named Tom Bruno around that time who was on the road with them. Did he work with you? DF:	No, again, I think he was a tour manager. I never got involved in…I’m the last guy to know how to set up an instrument. My basic interest was to make sure that they got their money, to make sure they were protected, and to make sure they got the best part of the deals. CC:	I got you. So mostly deals, and not the day-to-day stuff. DF:	Right. I came up with the idea for Levon to do the book, I got a writer for him, to do a record. I mean, I’m a creative person, too—I try to put people together. CC:	So more of the big picture, the vision. CC:	You worked with them through Jericho, and what happened after that? DF:	We did tour dates, I remember going to Japan with them—they were a huge hit. I remember going to the last Dead show, they opened and that was my first Dead concert and my last one, at Soldier Stadium. I remember being with them in Washington, D.C. at the ball for Clinton. CC:	The Blue Jean Bash? DF:	Yeah, the Blue Jean Bash. I remember all those great experiences with them. And I can understand why an Eric Clapton or a Ringo would hold these guys on another level, not only musically, but just their personalities. You know, Rick was just a very sweet, sweet individual. You could tell it was all about the music, you know. It was about the fans and it was about the music. It was out of sincerity, and from his heart, everything that he did. You know, never, never did he ever raise his voice. He was always into working, always into taking care of the fans and making music. Levon is a man of high intelligence. We’ve had a lot of discussions about life. From Levon, I’ve learned a lot. And I think today, Levon is getting the last laugh—the last laugh. He’s had this vision to have people come perform up there at his home, the Rambles. He’s had this vision for years and years to record up there. And God blessed him by giving him his voice back. He [thanked] his doctor, who helped cure him, from the stage the other night [at the Beacon Theater], and I thought that was beautiful. He said ‘He’s part of the band.’ He had his friends onstage, and I think that, in many areas, he’s been a real gentleman and a great father. And to see him sell out two shows at the Beacon in 15 minutes and to see him playing with musicians who want to play with him is a real tribute to him, to the Band, and to the late Rick Danko who I know is smiling and looking down and today would be as revered as Garth is and as Levon is. CC:	I agree, David, and that’s beautiful, really beautiful. You still keep in touch with Levon, obviously. CC:	Wow—that’s a great story. 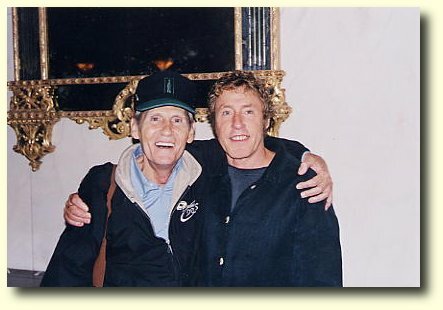 Levon Helm and Roger Daltrey at the Rock 'n' Roll Fantasy Camp, Rhiga Royal Hotel, New York City, June 22, 2003. Photo by Joe Lore.